This is one of those scene-setting pieces I don’t do as much anymore. I like doing them, but they can take a lot of time and effort for very little return other than the satisfaction of doing these stories. The subject here is a recreational basketball league of the type that can be found in just about any urban neighborhood. The idea was to capture the vibe of this distinct subculture to the extent that I put you as the reader there in the bleachers with me. To make the story a visceral experience. The article originally appeared in The Reader (www.thereader.com). Written as a secondary feature, I was surprised when it ended up on the cover. It’s not the first time that’s happened and I suspect it won’t be the last. Once the hoops get rolling in the Sunday men’s recreational basketball league, the scene turns into the kind of urban soul fest you associate with Chicago, Detroit, Philly or New York. Only this is Omaha. In an intimate, interactive community setting, the best summer ball in town is played in The SAL, Omaha’s version of the Harlem Ruckers League. Housed until recently in the Salvation Army North Corps center at 2424 Pratt Street, the league, by concensus, draws the area’s best players. Many have serious credentials. A typical game features jocks from the pro and college ranks, past and present, along with former and future legends from The Hood. All strut their stuff before a knowledgeable, appreciative, vociferous throng. NBA journeyman Rodney Buford, the ex-Creighton star, is a regular, rarely missing a game or a mid-range jump shot. One Sunday, fellow NBA player and ex-Bluejay Kyle Korver showed, raining down 3s to the fans’ delight. The league is so competitive Buford’s teams have never won the title. “That lets you know right there” said team sponsor Talonno “Lon Mac” Wright. “If you can make it through here, you’re a player. It’s the best competition you’re going to get in the city,” league director Kurt Mayo said. Mayo formed the league with wife Melissa in 2002, reviving a gym fallen into disuse. Before the Salvation Army, the league operated under a differnt name at the LaFern Williams Center in south O and the Butler-Gast YMCA up the street, where it’s back again. 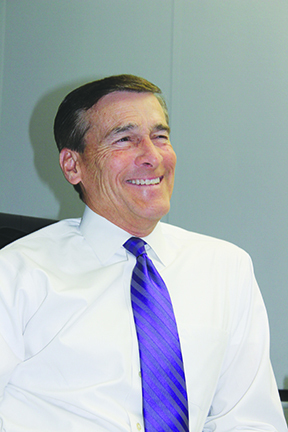 Mayo met resistance when he announced plans to move things to the Y at 3501 Ames Avenue. Trading the homey, if dingy, old digs for the gleaming, if cold, new facilities was an issue. But “the grumbling” ceased when the league ended the summer season at the Y on August 7. By all accounts, the new venue’s a hit, even if it lacks character. It does, however, have a nice wood floor, not some tacky mat like the Salvation Army center has. Mayo hopes to reinvent the magic at the Y with an “elite” level men’s Sunday league starting September 11. But The SAL is where the league gained the rep and made the memories. Where it found a fun yet gritty flavor as a combined sports venue and social club. The league is a subculture unto itself. The many female fans include spouses, lovers and groupies. Some mothers have children in tow. The guys taking-it-in range from hoop junkies looking for another fix to coaches scouting talent to neighborhood cats looking to escape the weather. The common denominator is a love for the game. It’s why some folks view five or six contests in a single sitting. 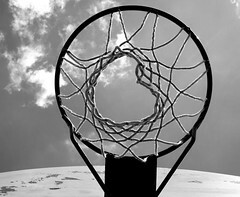 The hold basketball has in urban America is a function of the sport’s simplicity and expressiveness. Only a ball and a bucket are needed, after all, for players to create signature moves on the floor and in the air that separate them, their game and their persona from the pack. Not surprisingly, the hip-hop scene grew out of streetball culture, where trash talking equals rap, where a sweet crossover dribble or soaring airborne slam resembles dance and where stylin’ gets you props from the crowd or your crew. Music and hoops go hand-in-hand. The vast majority of players at The SAL and Butler-Gast Y are black, which makes it ironic that the two-time defending champs, Old School, are an all-white group of former Division I players led by Chubick. In what Mayo considers “a traditional” league, Old School is short on style but long on fundamentals. As the action unfolds on the funky, tile-like court everybody complains about, the spectators join in a kind of call-and-response exchange with participants. A player jamming home a thunder dunk will stop, await his fate from the crowd, and then either get their love or take their poison. A guy blowing a dunk or a layup or drawing air on his jumper gets well-deserved catcalls. But here the good-natured smack directed at refs and players is often hurled right back. Unrestrained displays of emotion, usually shouted down from the bleaches, sometimes overflows onto the court. Despite threats and invectives, few incidents ever come to blows. Chest thumping and trash talking is just part of the heat and the edge. It’s all about respect out here. No one wants to be shown up. As day wends into night, and one game bleeds into another, there’s a constant stream of humanity in and out of the cramped old gym, where music thumps from a boom box during time outs and between games, where burgers, dogs and nachos can be had on the cheap and where vendors hawk newly burned CDs and DVDs. Amid the hustle and flow, players and fans intermingle, making it hard to tell them apart. There’s no barriers, no admission, no registration. It’s a straight-up come-and-go-as-you-please scene. As the small bleachers hold only a couple hundred people, the rest of the onlookers line both sides and ends of the court. Folks variously stand against walls, sit in folding chairs or sprawl on the floor. The league serves many purposes. For college programs at UNO and Bellevue, it’s a way to keep teams sharp over the summer and toughened up for the coming NCAA season. Kevin McKenna, UNO head coach the past four years until rejoining the Creighton staff this summer, said, “I got my team to play down there the past few summers because I thought it was the best league. There was another league in town, but I felt this was the most competitive — where’d we get the most out of it.” Bellevue University coach Todd Eisner has recruited there. It helps Omaha Central grad and current Illinois-Chicago player Karl White get ready for the college grind. For former college mates, like the Still Hoopin’ squad made up of such ex-Bluejays as Buford, Latrell Wrightsell and Duan Cole, it’s a chance to relive old times, stay fit and feed still hot competitive fires. For Buford, it’s one more workout in an off-season regimen before NBA training camps begin. For men pushing 30, 40 or older, it’s also a pride thing — to show they still have some game left. For them and guys not so far removed from the game like Alvin Mitchell, the former NU, Cincinnati and UNO player, or Andre Tarpley, a senior last year at UNO, or Luther Hall, a recent Bellevue U. grad, it’s both an outlet and a place to prep for pro tryouts. For youngbloods, it’s a test to prove they can hang with the old dogs. “If you’re the best talent, or think you’re the best talent, this is where you’re going to be,” said veteran ref Mark LeFlore, Sr. Mayo said few high schoolers have had what it takes to play in The SAL. Two that did, guards Matt Culliver and Brandon McGruder, formed one of the highest scoring duos in the annals of the Metro Conference at Bryan High School last year. Both earned scholarships to play at the next level.